Kindly on lease from Nerwyn Stud. Lilian is a beautifully mare by the illustrious Nerwyn Cadno and out of the stunning Royal Welsh winning chestnut mare Nerwyn Leila. Lilian has an exquisite head, super bone and front and has the sweetest of natures. We feel lucky to have had the oppertunity to loan her and will really miss her presence when she returns to home end of 2010. 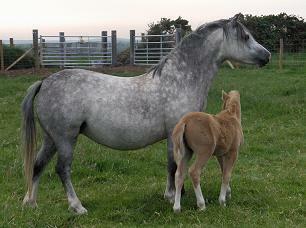 She has been running with Menai Motivation for a 2011 foal. Deucoch Nanw, by Menai Motivation.